WASHINGTON — Earth’s protective ozone layer is finally healing from damage caused by aerosol sprays and coolants, a new United Nations report said. This year, the ozone hole over the South Pole peaked at nearly 9.6 million square miles (24.8 million square kilometers). That’s about 16 percent smaller than the biggest hole recorded — 11.4 million square miles (29.6 million square kilometers) in 2006. But it’s not a complete success yet, said University of Colorado’s Brian Toon, who wasn’t part of the report. 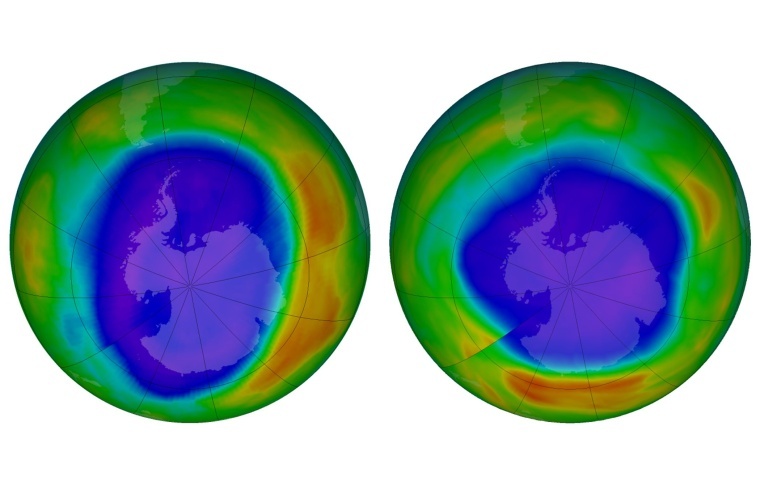 Scientists don’t know how much a healed ozone hole will further warm Antarctica, but they do know the immediate effects of ozone depletion on the world and human health, so “it would be incredibly irresponsible not to do this,” Salawitch said. And the replacements now being used to cool cars and refrigerators need to be replaced themselves with chemicals that don’t worsen global warming, Newman said. An amendment to the Montreal Protocol that goes into effect next year would cut use of some of those gases.